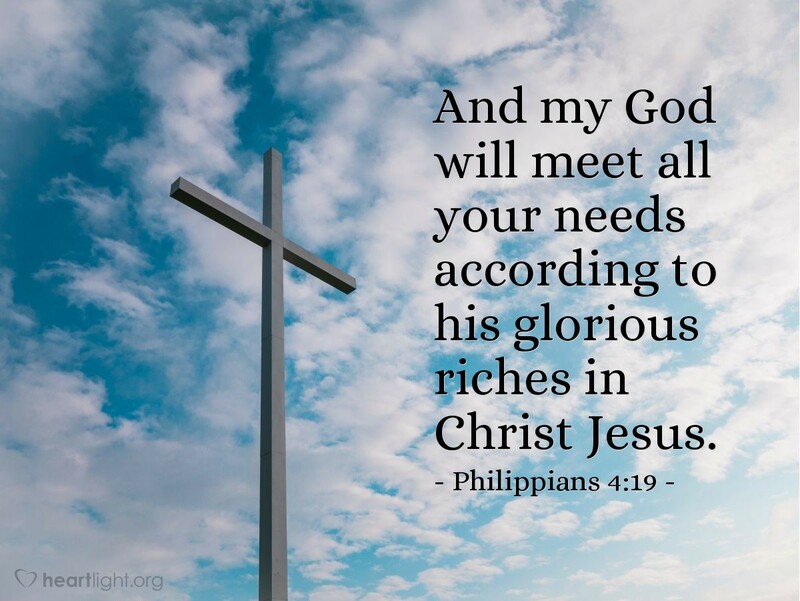 Paul gives the Philippians this promise only after he has emphasized to them that he had found the Lord's grace sufficient in good times and tough times, in times of plenty and in times of lack. The key to this promise is not just God's provision, but also our trust upon him to satisfy what we most need in Christ Jesus. When our hearts yearn to be full of him, to be pleasing to him, to be blessed by his presence, to be given the assurance of life beyond death, surely we can rely on his supplying everything we truly need! Give me eyes to see, O God, all the many wonderful ways you are providing for me and graciously providing the abundance you have poured into my life. I confess that my vision is shortsighted and narrow. I need to see the panoramic view of your graciousness. Yet the "little" part of your blessings that I am able to recognize is lavish, gracious, and fulfilling. I know you have blessed me with many more things that I do not see. Thank you for being so generous! In Jesus' name! Amen.